Transform Your Beliefs, Transform Your Life. New science proves that it is our core beliefs that drive the chemical changes in the body, control our thought patterns and essentially produce our reactions to the external world. If we can change what we believe about ourselves and the world around us, we can change our thoughts, and if we can change our thoughts… well, we can change anything. Seven years on from the birth of Matrix Reimprinting – a powerful technique that uses EFT to resolve traumas from our past – its creator, Karl Dawson, has adapted his revolutionary technique to ensure that practitioners focus on core beliefs to achieve lasting change in their clients’ lives. Karl Dawson and I joined together to create a book that explores how this work can help with everything from anxiety, grief, phobias and pain management, to parenting and self-image. 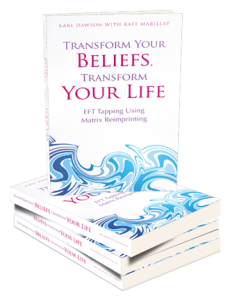 Whether you are new to Matrix Reimprinting or have known its transformative power since the early days, this book gives you a step-by-step guide to changing core beliefs for yourself or for your clients – whatever the life issue. The response to this book has been wonderful and it achieved best-seller status on Amazon! I’m now offering personal packages to work with me on several of the chapters outlined in the book. If you’ve read it and want to dive deeper, then book a free Discovery Session with me to find out how I can help. Every year, across the globe it’s estimated that 21 million people take cocaine. Each one has a different relationship with it. Meet some of them on the pages of this book. Go on a journey with lively characters and interviewees and discover the deep seated triggers, the supermen in the brain and the strong subconscious patterns behind cocaine use. 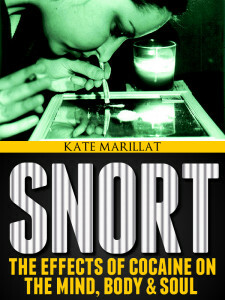 Snort, The Effects of Cocaine on the Mind, Body and Soul, gives you the insights, the facts, the fiction and above all else, it will change your relationship with the white powder that’s found in every town in our country. This book helps you create personal strategies to gently release cocaine from your or a loved one’s life and allows you to do it from your heart and soul. Move up the happiness scale with ease and find the therapies and techniques that work specifically for you. This book wouldn’t have been possible without the contributions from members of DrugsForum.com. Therefore 10% of the net profits from the sales of this book will go into their server fund ensuring that this valuable online forum remains viable.